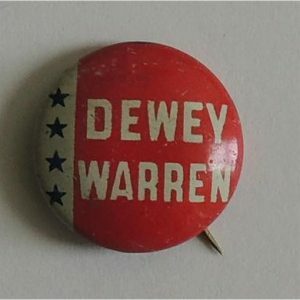 The United States presidential election of 1948 between Dewey and Warren was the 41st quadrennial presidential election, held on Tuesday, November 2, 1948. 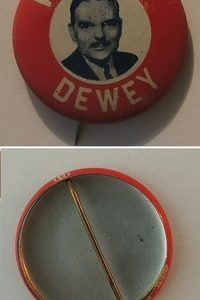 Incumbent President Harry S. Truman, the Democratic nominee, successfully ran for election against Thomas E. Dewey, the Republican nominee. The election is considered to be the greatest election upset in American history. 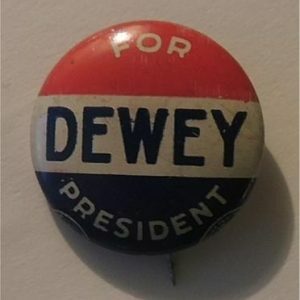 Virtually every prediction (with or without public opinion polls) indicated that Truman would be defeated by Dewey. Both parties had severe ideological splits, with the far left and far right of the Democratic Party running third-party campaigns. Truman’s surprise victory was the fifth consecutive presidential win for the Democratic Party, the longest winning streak in the history of the party, and second-longest in the history of both modern parties (surpassed only by the Republicans’ six consecutive victories from 1860 to 1880). With simultaneous success in the 1948 congressional elections, the Democrats regained control of both houses of Congress, which they had lost in 1946. 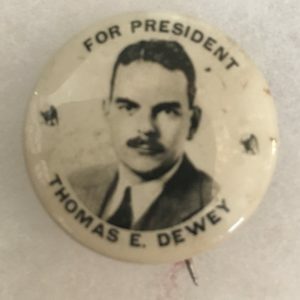 Truman’s feisty campaign style energized his base of traditional Democrats, most of the white South, Catholic and Jewish voters, and in a surprise—Midwestern farmers. Thus, Truman’s election confirmed the Democratic Party’s status as the nation’s majority party, a status it would retain until the conservative realignment in 1968.